CARBONDALE, Ill. — What better way to explore the world around you than by venturing into new and different areas through summer camp experiences? 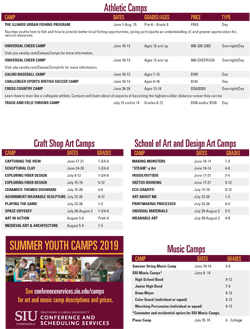 Children can discover a new interest, a new aspect of a favorite activity, or improve their skills and more at Southern Illinois University Carbondale’s 2019 Summer Youth Camps. SIU’s Conference and Scheduling Services is coordinating a big lineup of academic, artistic, music and athletic skills camps for children ages 5-18 this summer. SIU is hosting numerous academic camps this summer. Included are multiple sessions of the popular Lego camps, with different sections for various age groups and interests all summer long. Younger children in grades 1-2 can enjoy Beginning Lego Engineering Camp while kids of other ages can participate in Lego Mindstorms, Advanced Lego or We Do Robotics Lego camp sessions. Children of all ages can also participate in SIU’s award-winning architecture camps, with different sets for specific age groups. Is your high school age youth leaning toward a particular career? SIU may just offer a camp that would help them test their job selections. The Accounting Career Awareness Program gives minority high school students the opportunity to explore a career in accounting/business while the Writer’s in Common camp brings together creative writers for a time of learning and sharing. Take to the skies for the Summer Wings Aviation Camp or explore the career possibilities for women during the junior high Girls Steam (science, technology, engineering, agriculture and mathematics) Camp. Other possibilities are numerous and include Challenge to Excellence camps; Mindfulness Camps, where participants will learn to focus and relax through techniques such as yoga and breathing exercises; and the STEM on CAMPus event, held in conjunction with the Boy Scouts to allow campers to earn merit badges and awards. Children can improve their skills and have a great time at the various sports camps offered this summer. SIU athletes and coaches will share their expertise with camp participants. Fishing, cheerleading, baseball, soccer, cross country and track and field are scheduled. Youngsters can explore their artistic side via two sets of camps, each featuring a variety of options for different ages, from pre-kindergarten through high school. The Student Center’s Craft Shop is sponsoring workshops as diverse as sculpting clay, fiber design (with printing, dying and sewing), drawing and painting, ceramic dishes and fun and funky jewelry. Children can also invent personalized board games, explore space with themed artwork and discover various art forms and put them into action. Kids can even design and create their very own medieval-inspired castle forts. Even more chances to explore the wide world of art come through SIU’s School of Art and Design. Children can create stepping stones and mobiles, make monsters, sketchbooks and eco-friendly graffiti and learn to make prints for T-shirts and other items. Participants will craft wearable art, put their imaginations to the test creating art from the most unusual materials — think converting a toy car into an ancient warrior — and even learn more about themselves as they use plaster, paint, ink and other materials to explore their fingerprints, footprints, voice and hands. There will be melodies in the air this summer too, as campers from grades 3 through college age come to SIU to hone their musical expertise. Junior high and high school band students will find camps just for them, as will drum majors, color guards and marching percussionists. The university is also sponsoring a piano camp and the summer string music camp. Some camps are only during daytime hours while others are residential camps. Some offer both options. Professionals who are experts in their fields lead each of the camps. Numerous campus faculty, staff and units are involved in creating enriching, educational and fun summer camp experiences for the children. Each session is designed specifically for a certain age group, with age-appropriate activities and fun planned. Many of the camps fill quickly, so organizers recommend registering early to secure a spot. 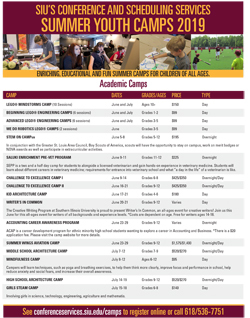 Find the complete summer camp schedule, along with pricing, online registration, and other details, at conferenceservices.siu.edu/camps. You can also register or obtain more information by calling 618/536-7751.